Sold out. 10-15 seeds. New for season 2019. 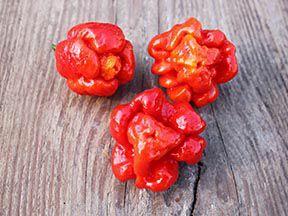 A variety is one of the hottest peppers in the world. 10-15 seeds. A variety of sweet pepper easy to cultivate. Has big fruits with thick walls that are great for baking, salads and conserves. Sold out. 10-15 seeds. A very productive variety with compact plants. 10 seeds. New for season 2019. A productive orange pepper. 15 seeds. An Italian variety. Fruits resembling bull's horns grow up to 25 cm. 10 seeds. New for season 2019. A productive yellow pepper. 10 seeds. New for season 2019. A Italian pepper with long horn-shaped fruits. 10-15 nasion. Caribbean pepper growing in Mexico and South America. Sold out. 15 seeds. 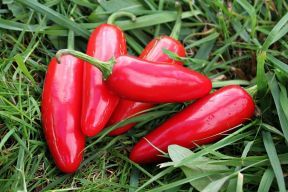 An old Hungarian hot pepper variety. Sold out. 10-15 seeds. 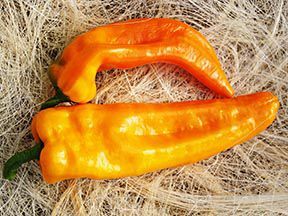 A Italian heirloom pepper from Tuscany with dark-red mild heat fruits that grow up to 15 cm. Sold out. 10 seeds. One of the most popular peppers. Easy to cultivate, has thick walls and great taste. 10 seeds. New for season 2019. 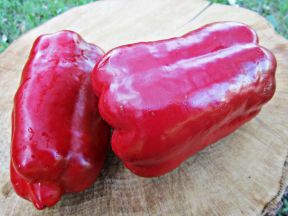 The red variety of Marconi pepper with long horn-shaped fruits.